You can spends hours giving the most comprehensive bankruptcy consults, but I doubt there’s a bankruptcy lawyer out there who hasn’t had an irate client blaming them for having their credit accounts closed or needing to produce additional documents. If they signed something in writing they will probably say it either wasn’t clear or they didn’t have time to read the entire thing. In addition, have you noticed that you give mostly the same consultation over and over again? I found myself pondering the above one day while visiting my parent’s home and noticed the DVD packaged with their Cuisinart. I thought to myself if this works for appliances, why not bankruptcy? I did some more research and discovered that DVD costs have decreased to the point that a DVD could be sold at prices where it would make sense to just give every client a copy. I also discovered that entire video production companies exist just to produce videos explaining benefits for corporations. A much smaller market than the over million bankruptcies filed a year. I searched high and low for a product, but could only find a rambling hour and a half presentation from the late 1990’s on Amazon with a review by another lawyer who was looking for the same thing! To top it off it would cost over $40 a copy which would eliminate the idea of simply giving clients a copy. 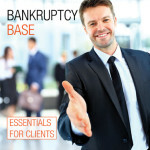 After a over a year trying to get the production together I can now present the Bankruptcy Base DVD – Essentials for client. For less than five dollars a client you can save time, streamline client handling, reduce irrate clients who forget all the warning and blame you on influential internet ratings sites, gracefully exit unproductive consults early, and improve your marketing and retention. Order Below to see how you can move you practice into the future.